This is a true story, as evidenced by the photographs. But you know me: I can’t help dramatizing things a little. 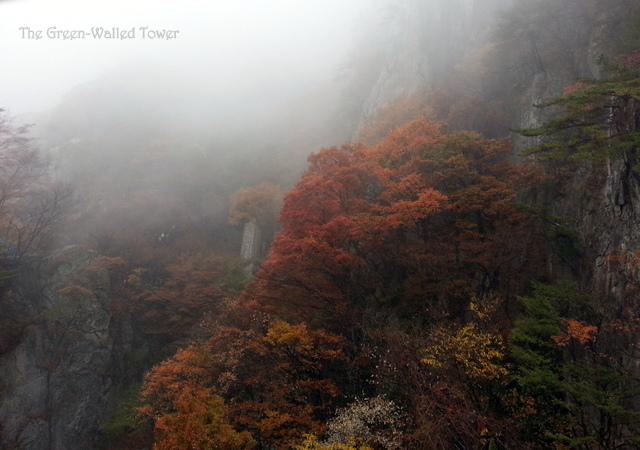 Koreans love them some mountain climbing and they love them some autumn colors. 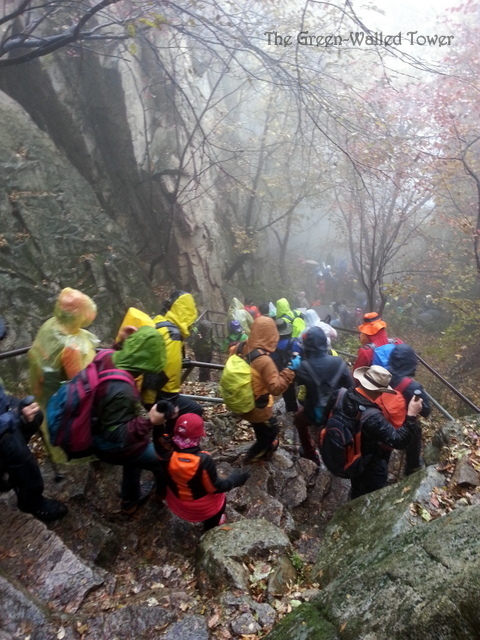 And considering that everyone loves them some weekend, going mountain climbing on a Saturday in Korea in the fall is like a perfect storm, especially in the rain. The sky was overcast when I left the house in the morning. 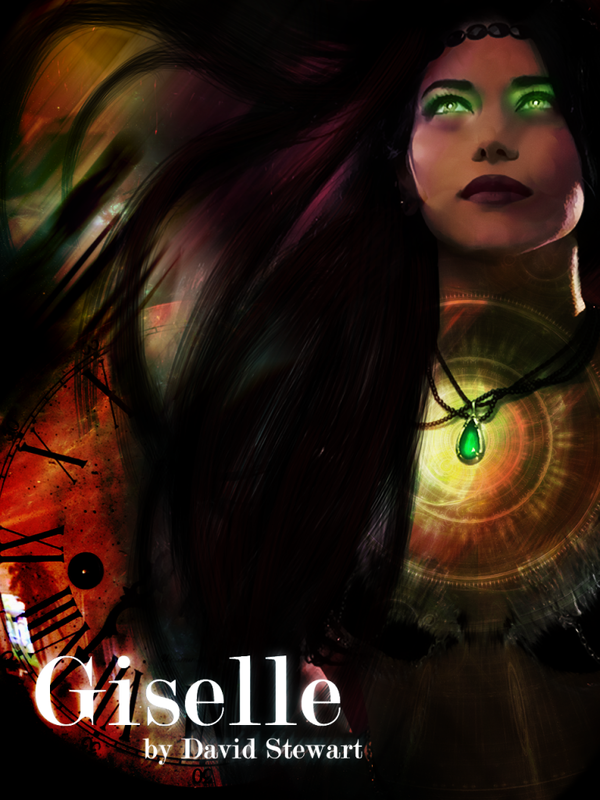 I couldn’t find my umbrella, but I had a magic talisman that prevented rain. At least, it rarely rained when I was carrying it and I believe strongly in the principle that correlation implies causation. I got to the mountain (which is also a provincial park) and as the bus passed long lines of cars parked along the side of the road, my heart sank like a bowling ball in a banana souffle. It was, as the Chinese say, a mountain of people, a sea of people. If zombie hordes wore expensive hiking gear and preyed on autumn leaves, I would have been in a George Romero film. The rain started as a fine mist about halfway up the mountain. 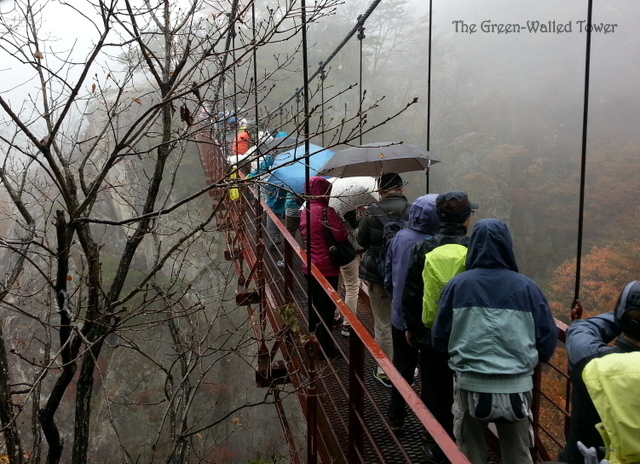 By the time I got to the park’s famed Cloud Bridge, the path had bottlenecked and so we all stood in the rain, shuffling forward at a snail’s pace until I finally reached the bridge. I looked down at the path 250 feet below me and saw the winding, ant-like column of hikers abandoning the mountain. I saw a sign saying the maximum number of people on the bridge was 200. Not that anyone was counting. I gave up the idea of going to the peak. A cloud had sat on the mountain as if it were snuggling into an easy chair and after the bridge was a treacherous metal stairway, over 200 feet high and as steep as a ladder. I wasn’t the only one who decided to cut the trip short and head for the cable car station nearby for a quick trip to the bottom. The trails were choked with sodden hikers, some with expensive cameras, jewelry and nice purses, all picking their way down the slick rocks. I felt like we were refugees from some disaster. 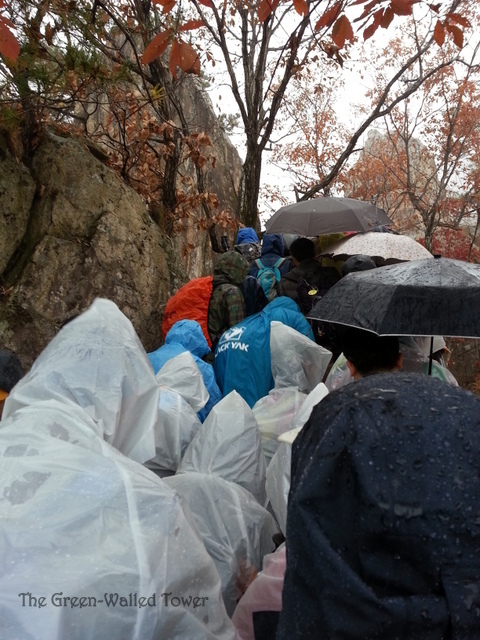 The group on the left are the ones who climbed under a railing and swarmed down the rocks to cut in line on the main path. “All it takes is one person to slip…” I kept thinking. There was a two-hour wait for the cable car, nowhere to sit and nowhere particularly warm. At least the view was pretty. I got home four hours later and soon the apocalypse was only a distant memory. It’s amazing what a hot shower can cure. 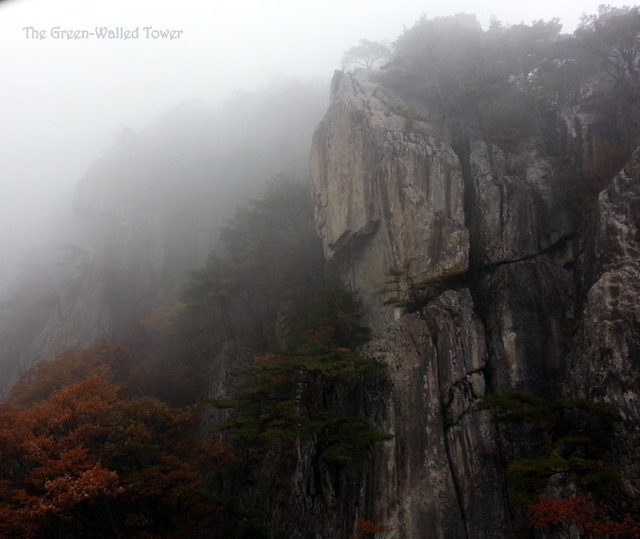 This entry was posted on Monday, November 4th, 2013 at 9:26 pm	and tagged with adventure, apocalypse, Daedunsan, hiking, Korea, mountain climbing, mountains, non-fiction, outside the tower, photograph, rain, Wanju and posted in Dusk. You can follow any responses to this entry through the RSS 2.0 feed. 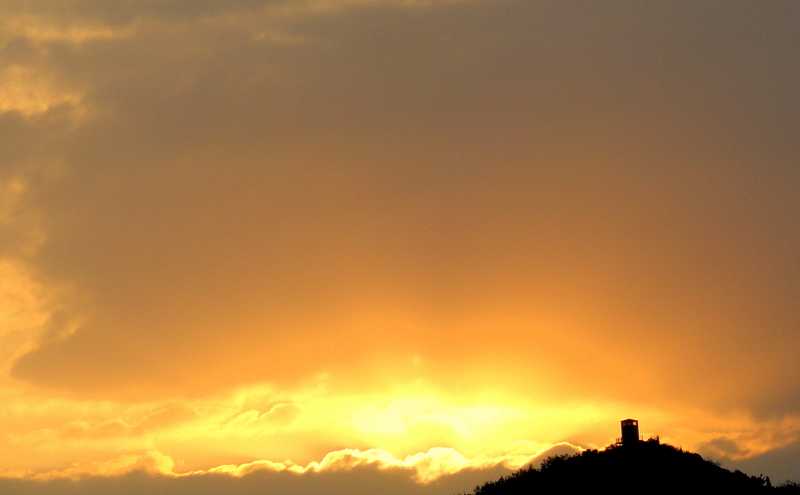 Your pictures are breathtaking! Wow. But, I can’t believe all the people! Zombie apocalypse is right. It looks very slippery, too. Yikes. If a person fell down that hill, there could be a whole domino effect. Not the most relaxing hike, huh? Great photos. It is a miracle the bridge did not crumble under all the hikers, and people got down safely. 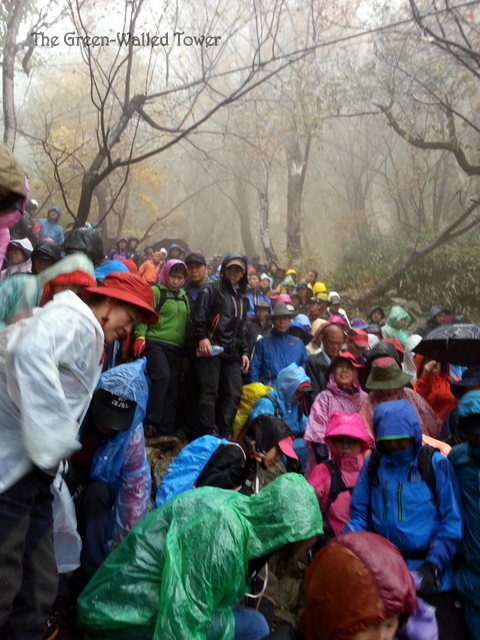 They must really love hiking up mountains to go in rain like that. On our peaks like Long’s Peak it would be disastrous as it is over 14,000 on the summit. this was a provincial park so the trails were pretty safe, although this one is less than some. This mountain was only about 3000′. people, people and people everywhere 🙂 I envy their energy a lot. Wouldn’t have believed the crowd without those photos, wow. Is this really the norm for weekend scenic hiking, or was this particular day a special occasion of some sort? 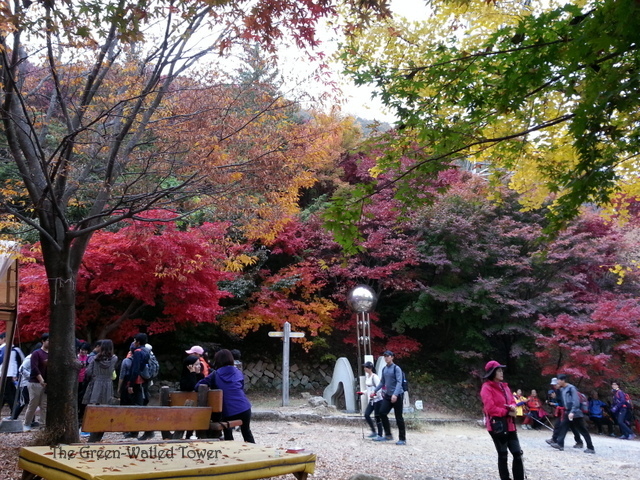 This is normal for very popular parks in the fall, since a lot of people go out to see the leaves. There is a national park which is apparently much worse than this, but I’ve never gone in the fall, for that very reason.